Today was a non-working day for me, so this morning I met the charming A for breakfast at Seven Seeds (the latest venture of Mark "Brother Baba Budan" Dundon), which opened yesterday. 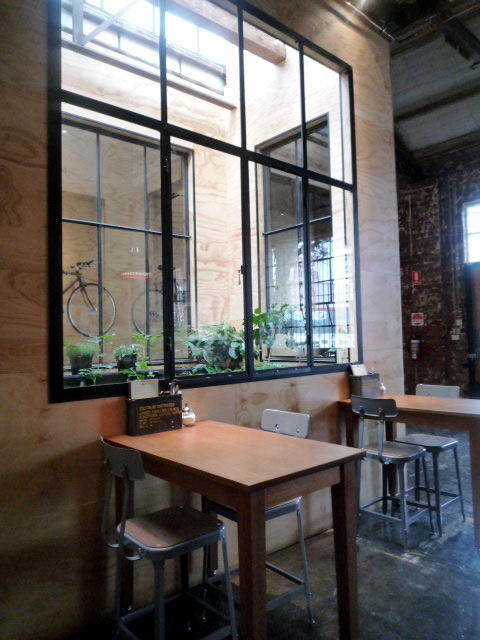 As with several of Melbourne's other coffee houses, Seven Seeds favours a light-industrial, distressed-brick, exposed-beams workshop aesthetic which I love - particularly the shiny shiny floor, wall-mounted bike racks and the teacosy-like coverings on the lamps. 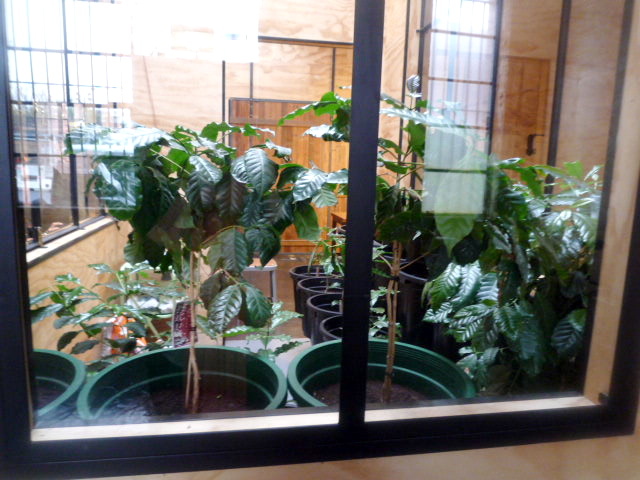 The cafe part of the space abuts the central lab and atrium, which is filled with potted coffee plants. Spotted a spectrometer (or is it a spectrograph? 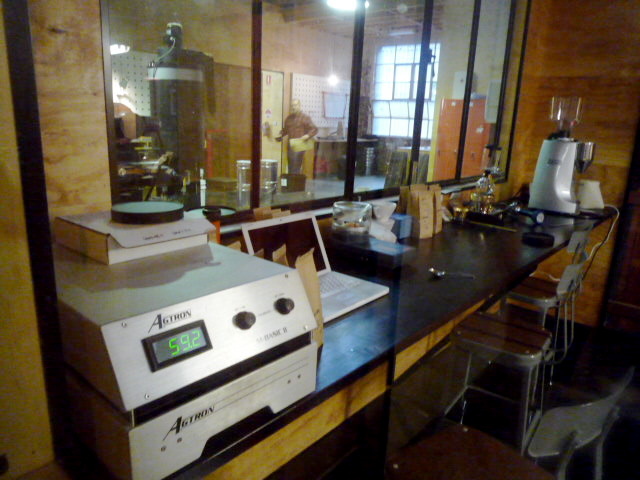 It's been ten years since I studied wine making) and other coffee geek gadgets in the lab. 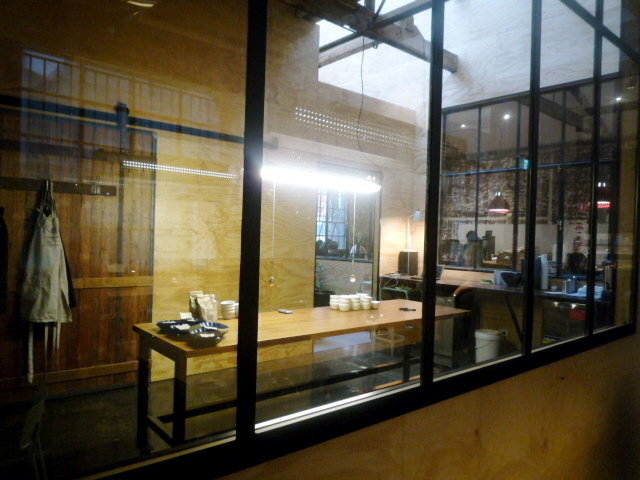 The actual roastery is in the back room. 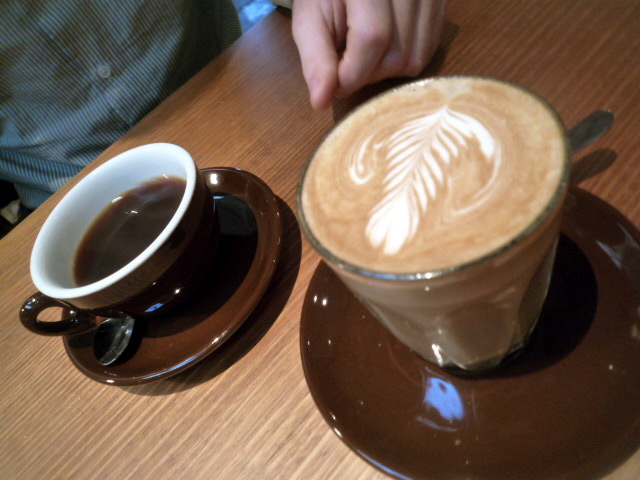 I was a wimp and ordered a latte, but A had a clover coffee, using beans from Panama. 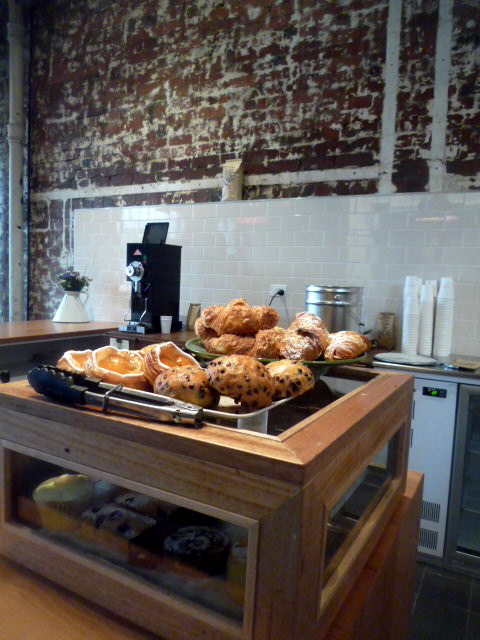 The menu is very simple at Seven Seeds: pastries, toast, muesli and hot pressed sandwiches. Love the way the kitchen is partitioned off from the rest of the space. For breakfast, we decided to share something sweet and something savoury. 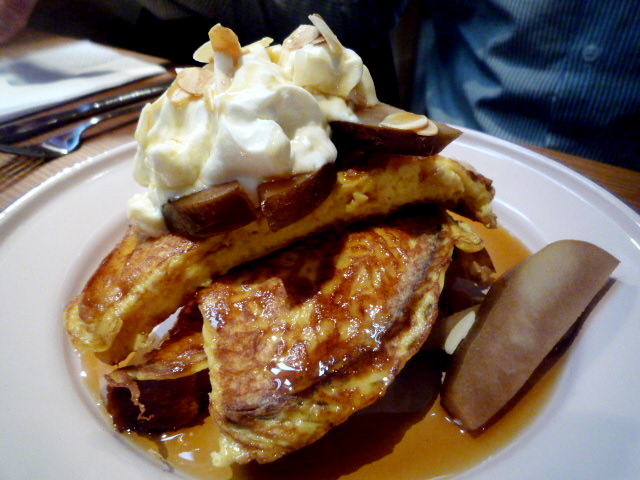 A selected the French toasted brioche with pear, ricotta, roasted almonds and "honest" maple ($11). Nice and eggy, but there was so much soft ricotta, we couldn't finish it. 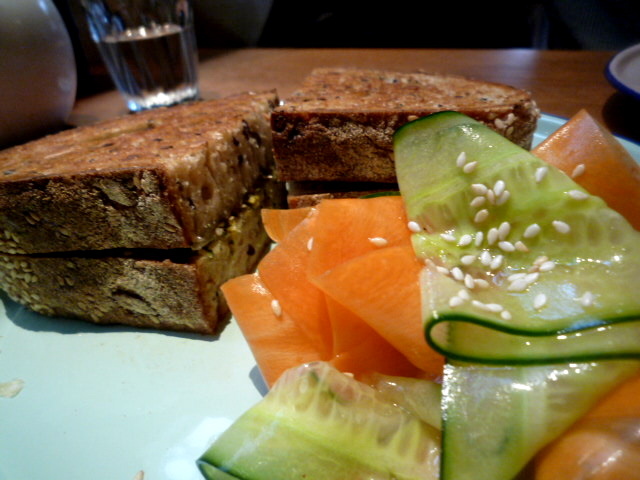 I chose the hot pressed sandwich with pecorino, dukkah, sage and lemon zest, with a side of shaved cucumber and carrot in vinaigrette ($9) - an admittedly bold choice for before 9am. Massively thick slices of multi-grain Dench bread meant that we couldn't finish this one either. Good flavours though. That "lab" in the middle looks cool too, reminds me of Species or Fifth Element for some reason? 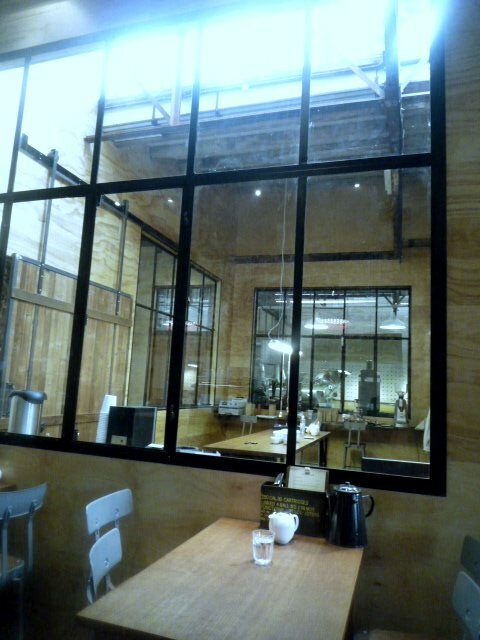 As long as the coffee plants don't mutate and freak out and smash the glass and run rampant across the city. Jess: so did you go? What did you think? Hi Ryan, I look forward to reading your take on it. Oh, and I would pay good money to watch Day of the Hypercaffeinated Triffids. Looks great! 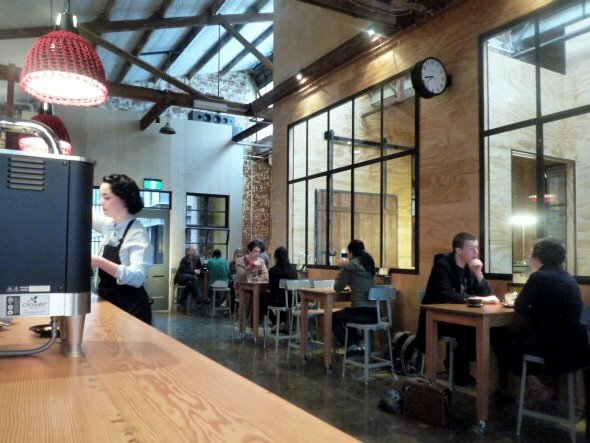 Interesting just how many Melbourne cafes/bars have that industrial thing happening. Where did it start, I wonder? The Provincial? The Malthouse? Um, I just went there for lunch and had the sardines. Yum. I do relish relish, and fontina. And a good coffee.. smooth. Lovely service too. Thanks for posting that, Claire- Don't think I've ever been somewhere before that's said "we've only been open a week"! Wow! This place looks pretty cool. I should visit it one day on my uni-break. Lovin your blog by the way. 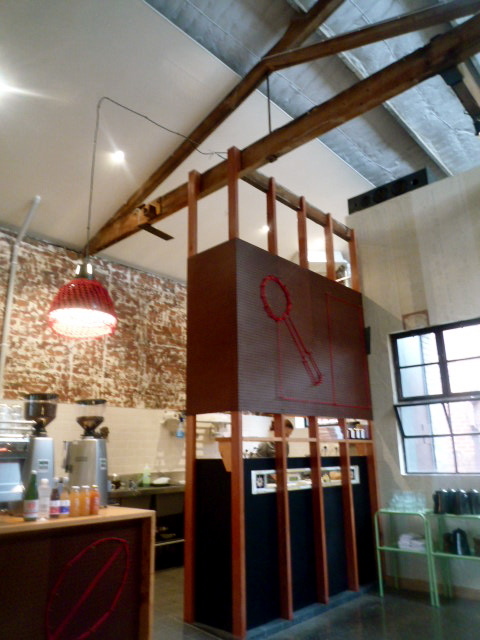 Thanks for the review Claire - I am in Grattan St so this is right around the corner! I went this morning and the coffee was beautifully presented and tasted sensational. 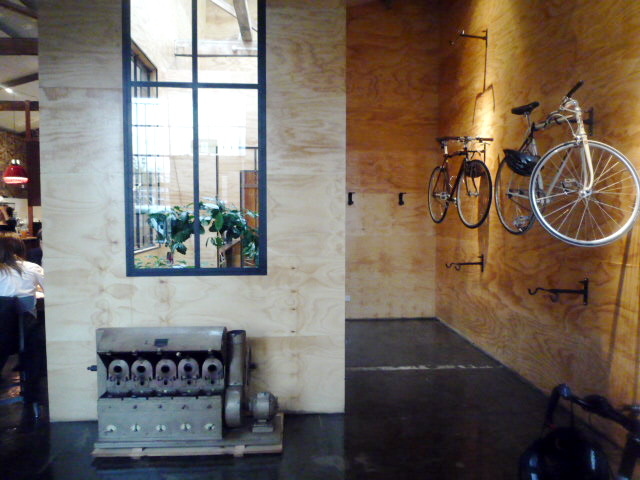 Loved the layout and the bike racks. It was pretty quiet this morning but I suspect this will change post-exams and once word gets out. Love your blog and as I am new in Melbs I am using as a reference point - loved Liaison and Porgie&Mrs Jones, both of which I visited after reading your reviews. Oh, and +39 as well! Do you still need recommendations for NY? If so try Burger Joint at Le Parker Meridien (finding it is half the fun - look for the neon hamburger), and shake shack at Flatiron(prepare to queue), Egg in Williamsburg Brooklyn for breakfast and Levain Bakery (upper West side) makes six ounce cookies that will do your head in! Completely off topic, but do you know where I can get insight to Box Hill restaurants? Has anyone blogged about the plethora of asian food out there? Any tips would greatly appreciated. Hi Japan Eats. Thanks, glad you like the blog! Yes the industrial look, whilst not unique, is still very "Melbourne", isn't it. Good to hear the sardines are good Cathy! Will order them next time. Thanks Megaman! I reckon it'll be swamped with people from Melbourne Uni (especially the law school) once semester 2 starts. Hi ailsa, thanks for your kind comments and especially for your New York recommendations! They're going into my little red book. I LOVE the Flatiron, can't believe I'll be there in less than a week!! Hi Kymbos, as you can see from the suburbs I blog about I'm afraid I'm not much help about Box Hill (living in Richmond and not owning a car means I just don't ever get out there). It's a pity, as I would love to explore all the good Chinese restaurants out that way. that's it. i'm moving to melbourne to eat. My sardine toastie was great but the coffee wasn't as good as expected. Their espresso beans are working very well in my Diamond Italia at home. My new favourite. 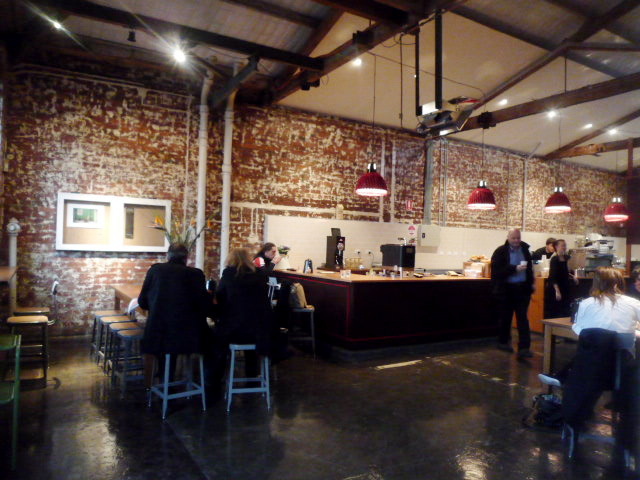 I recently went to Seven Seeds and was surprisedly disappointed. My coffee was weak, bitter and tasted like a mixture of burnt milk and soy sauce when it was meant to be a latte. Regardless of specialty blends, Brother Baba Budan or their upstanding reputation, I won't be going back there. We just tried Seven Seeds this morning and overall were very unimpressed! Coffee not great and the food was not good at all. Hot chocolate was excellent though! They have obviously slipped a lot since they opened a year or so ago. I like the look but wonder if it's an experiment in and of itself that we may never see the like of again?